Mick Goodwin heads up Dog Force Australia following a successful 29 year career with the NSW Police Force. Mick finished his distinguished career as a Superintendent of Police and Commander of the New South Wales Police Force – Counter Terrorism & Special Tactics Command – State Protection Group Dog Unit – the largest canine law enforcement organisation in Australia. As Commander of the NSW Police Dog Unit, Mick pioneered some cutting edge strategies including the introduction of the Detection Dog Breeding Program and the Dog Unit Regionalisation Project which introduced the deployment of police dogs to regional areas throughout NSW. During his service as a senior officer with the NSW Police Force, Mick’s impressive list of credits include appointments as Operational Commander at the Bathurst V8 Supercar Motor Races (2008, 2009, 2010 & 2011), 2009 NRL Grand Final and the 2009 Australian Papal Visit. 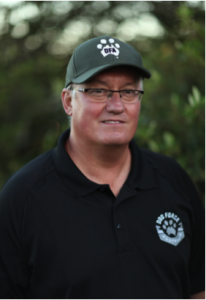 Mick has vast experience in Human Resource Management and has delivered extensive training and development strategies in his former role as Commander of the NSW Police Dog Unit. Mick has completed an Associate Diploma in Administration (University of Wollongong), Certificate IV in Workplace Training and Assessment, Diploma and Certificate IV in Security & Risk Management, Certificate III in Investigative Services and is an Approved Trainer with the NSW Police Force Security & Licensing Enforcement Directorate (SLED).